What to Get Mom for Christmas 2018 - Gift Ideas That Will Make You Her Favorite Child! Wondering what to get Mom for Christmas 2019? Make Christmas memorable with one of our top 20 Christmas gifts for Mom - prices start at under $25! The family is always at the center of a mother's heart. This beautiful birthstone ring is the perfect way to celebrate your mother's love and the family unity. The ring is delicately engraved with the names of up to six children. 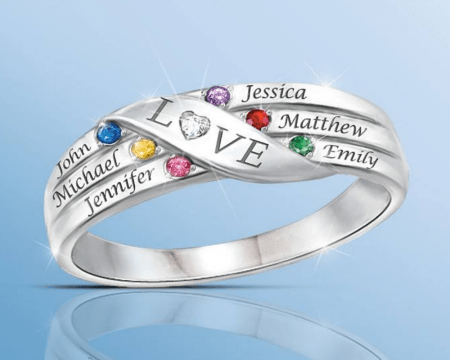 Next to each name is a brilliant crystal birthstone that sparkles with the light. Through the center of the ring is a silver ribbon engraved with the word "LOVE" which gracefully wraps across the ring bands, just like how a mother's love keeps her family together. In the center of the word "LOVE" is a genuine diamond that completes this exquisite presentation. This ring is sure to become one of your mother's favorite keepsakes. Your mother will enjoy basking in the luxury of this super-soft fleece robe during those chilly winter evenings. The robe is made from the fluffiest micro-fleece material that feels like pure heaven to the touch. The robe can be embroidered with her name or initial in block letters or in an elegant script font. You can choose from 15 colors for the embroidery. This robe will keep your mother warm and cozy any time she wants to relax around the house. Your mother's love has no end! This sterling silver pendant is masterfully designed in the shape of the infinity symbol, which beautifully represents her lifelong devotion to her family. The reverse side of the pendant is engraved with the touching sentiment, "A Mother's Love Is Forever." The top of the pendant is mounted with a glittering genuine diamond. The bottom of the pendant can hold up to six gorgeous ring charms, each embellished in radiant and colorful Swarovski crystal birthstones. Your mom will treasure this Christmas gift as a precious symbol of her never ending love for her children. 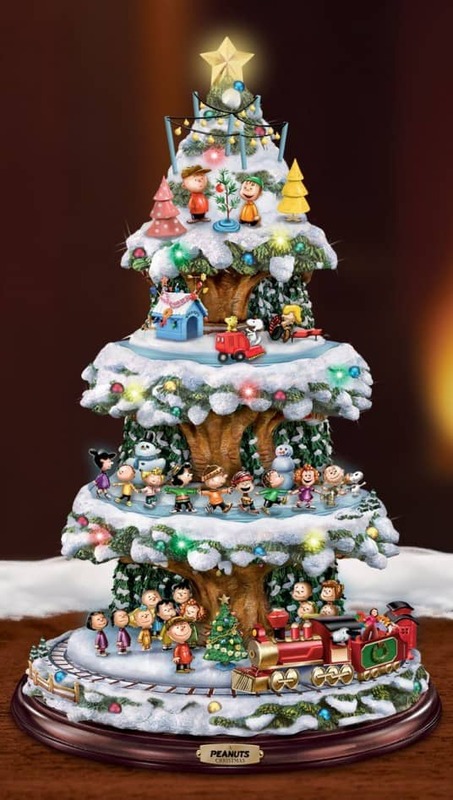 Delight your mother with this charming tabletop tree decked with her favorite PEANUTS™ gang. See the tree come to life with action, lights, and music from the beloved "Charlie Brown Christmas" classic. The bottom level features a festive Christmas train going around the base. The second level features the characters "skating" around the tree hand-in-hand. The top level has Snoopy and Woodstock driving a Zamboni, going around the decorated dog house and Schroeder on his piano. This whimsical tabletop tree is the perfect centerpiece that is sure to warm the hearts of everyone in the family. 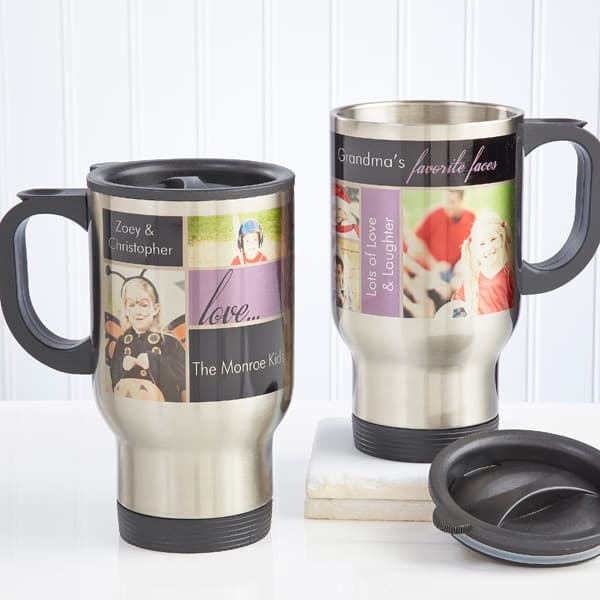 This adorable personalized travel mug is perfect for the busy mom who is always on the go. You can add up to five photos of family members that are arranged into a lovely collage that wraps around the mug. Complement the photos with three personalized messages that can include names, dates, or a short sentiment. Add a title to the top of the mug to make this a truly practical and meaningful gift. 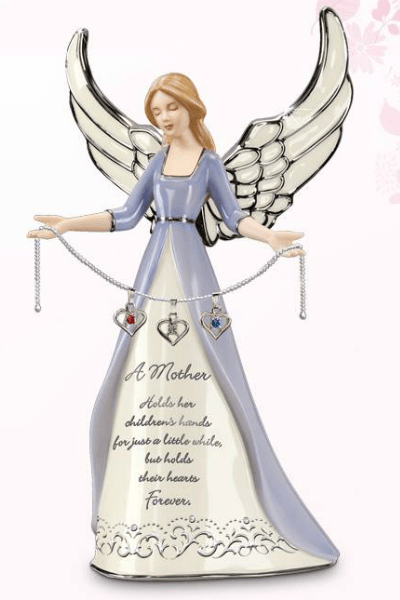 This exquisite angel figurine celebrates a mother's love and protection for her children. The mother angel figure stands gracefully with her satiny wings elegantly arched up toward the heavens. Her outstretched hands gently hold a silver chain between them. On the chain, you can add up to five brilliant birthstone heart charms that represent your mother's children. The front of this beautiful porcelain figurine is inscribed with a moving sentiment honoring a mother's eternal love. Honor your mother's love for the family by giving her this brilliant birthstone bracelet. 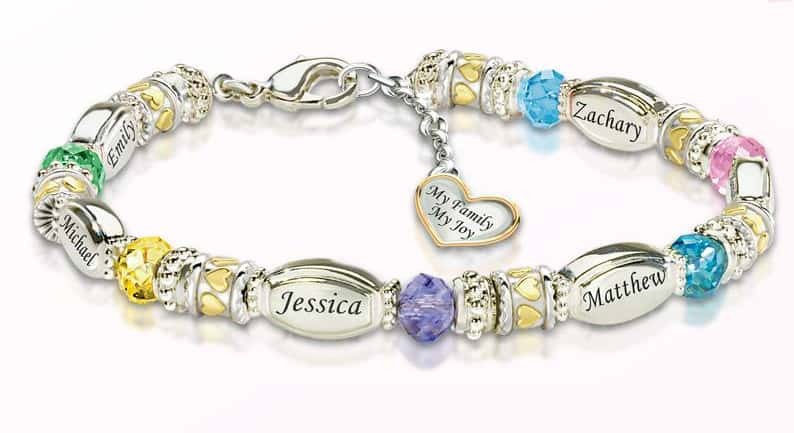 This work of art features up to six shiny, silver-plated beads that can be finely engraved with the names of loved ones. 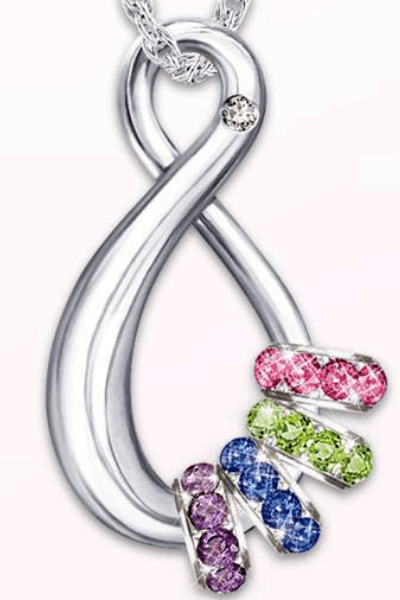 Each bead is paired with a gorgeous Swarovski crystal birthstone in brilliant color. Between the settings are other silver-plated beads including ones that are embellished with tiny hearts plated in 18K gold. To complete this exquisite design, the bracelet has a silver heart-shaped charm, outlined in gold, showcasing the sentiment, "My Family, My Joy." Your mother will be touched by this beautiful representation of her love. This artistic photo wall puzzle plaque is a wonderful way for your mom to celebrate the special moments in her life. 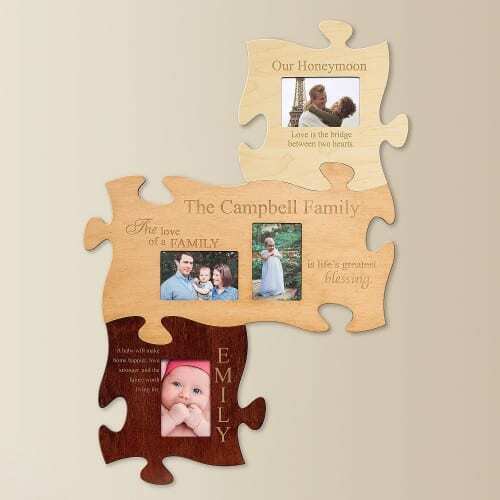 Each photo puzzle piece can be customized with a personal message of your choosing. The pieces are made of a wood veneer in natural and cherry tones that complement each other very nicely in an interlocking pattern. As the family continues to build memories, additional pieces can be added to form a truly unique presentation of the family's most special moments. Your mom can welcome the holidays to her home with this cute Santa sled. This classically styled sled is finely constructed out of wood with runners made from metal. It even has a rope twisted from twine, just like the sleds from the old childhood days. A beautiful Santa design adds a truly festive look to the sled. Finally, the family name is masterfully engraved by laser at the top of the sled. 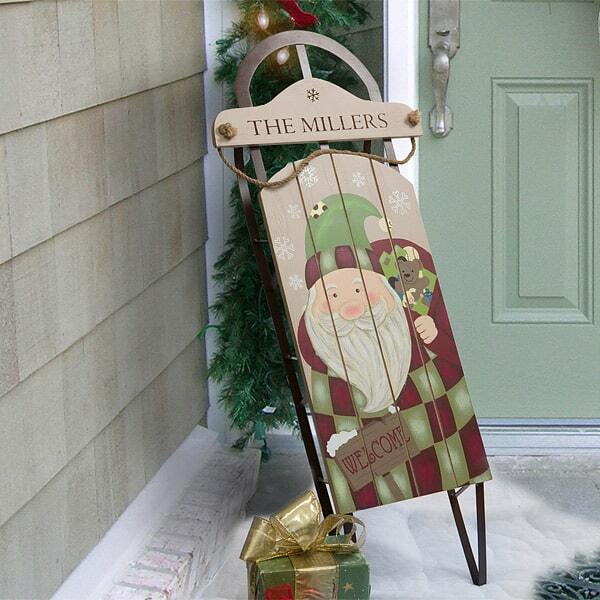 Your mother will delight in a new family tradition as she decorates her home with this charming sled every Christmas. This adorable cookie jar is the perfect place to store those delicious cookies that your mother bakes out of her love. 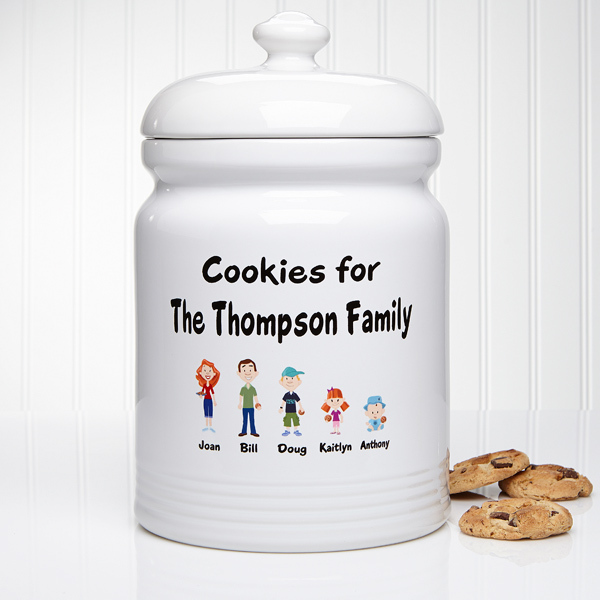 Personalize the cookie jar with your family's name across the top of the jar. Then, for each member of the family, select a delightful cartoon character that matches the person's physical features including skin tone and hair style. The family member's name appears beneath each character. The result is a charming caricature of the whole family. Your mom will want to keep this special cookie jar full of her delicious treats and love for her family. 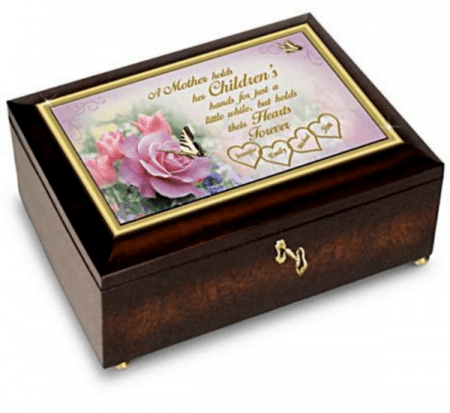 Celebrate your mother's love for her children with this exquisite mahogany music box where she can keep her favorite treasures. The glass lid is beautifully decorated with a floral and butterfly motif on the left side. To the right is a heartwarming message etched in golden script dedicated to a mother's devotion to her children. Below the message, up to six hearts, each inscribed with a child's name, can be added to complete this lovely presentation. When your mother hears the sweet tune of "You Are My Sunshine" from the music box, her heart will be lifted with the blessed joy that her children have brought to her life. This family tree necklace in pure sterling silver is the perfect symbol of your family unity. 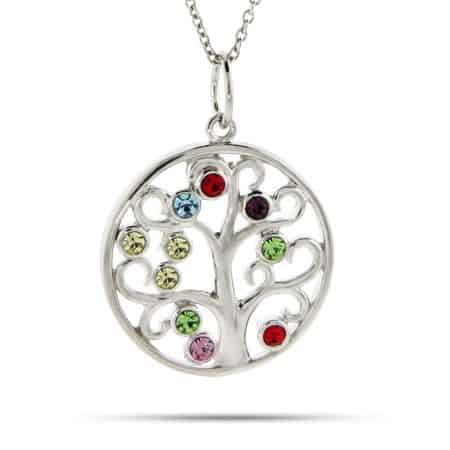 Your mother will be thrilled when she sees her family tree shimmer and sparkle with the colorful birthstones of her loved ones. Up to ten beautiful birthstone crystals can be added to the graceful curves of the tree. 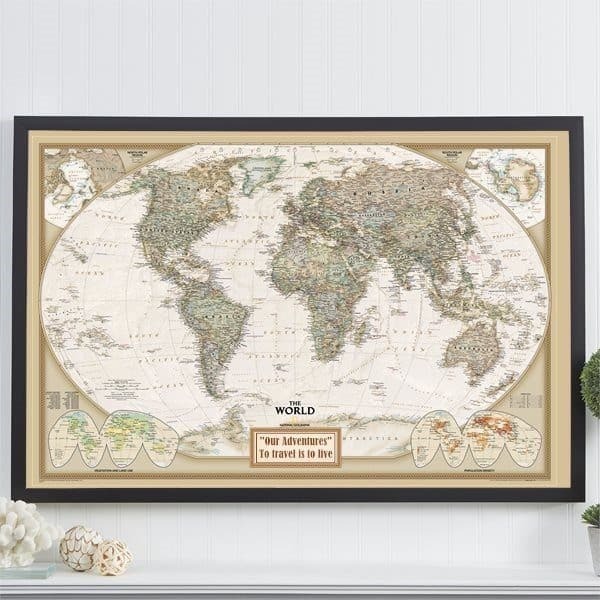 If your mother loves to travel, this elegant world map is the ideal gift. The lovely framed map is backed with a foam core and is designed in a rich sepia tone that lends a nostalgic feel to the look. Your mom can use the colorful push pins that come with the map to mark the places that she has traveled to, destinations of her future dream vacations, or homes of her dear friends and loved ones. At the bottom of the beautiful wooden frame is a name plate where you can add a special personalization in gold foil. Click here to see the United States map. Your mother can wrap herself in her family's love with this soft and cuddly fleece blanket. 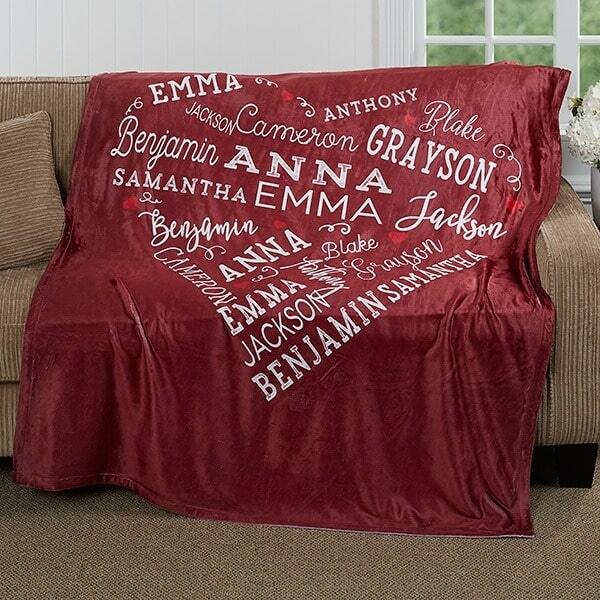 The blanket can be personalized with up to 21 names of people from her beloved family, which are artistically brought together in a repeat pattern to form a large, beautiful heart in one corner of the blanket. This is sure to become your mom's favorite blanket every time she wants to snuggle up with a good book or relax with a cup of tea. 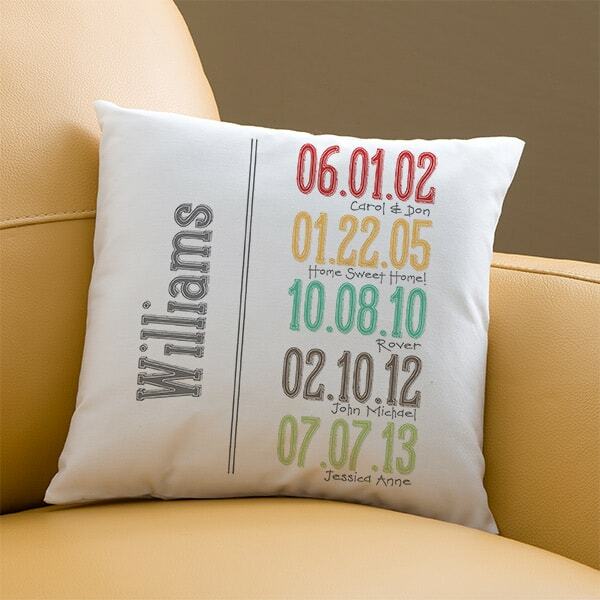 If your mom seems to have everything already, she will be pleasantly surprised by this milestone dates gift idea. The unique design allows you to commemorate five important events in your mother's life. On the right side of the gift, each event is customized with a date in large, colorful lettering followed by a brief line of text highlighting the significance. On the left side, the family's name is displayed in large lettering. Your mother will be proud to showcase this wonderful present in her living room for all of her visitors to see. 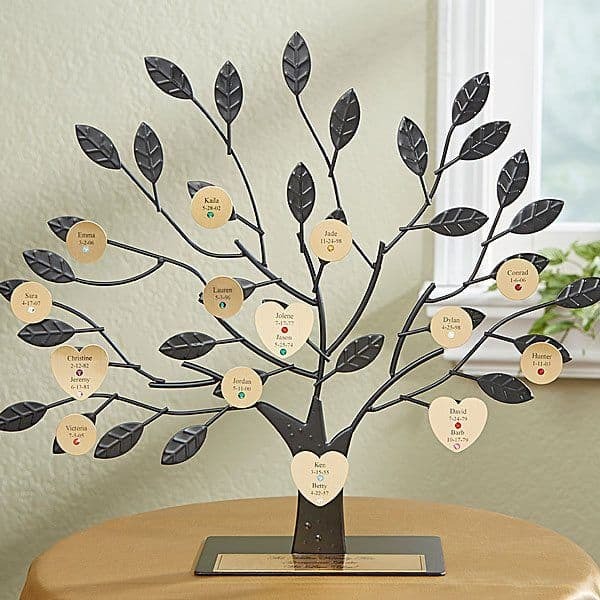 Your mom will love this graceful family tree that is sure to play center stage in her home's decor. The base can be engraved with a special dedication or sentiment. You can add a magnetic disc for every member of the family. Each disc is delicately engraved with the loved one's name and birthdate and embellished with a birthstone. Special heart-shaped discs represent couples. The tree and the discs come in gold or silver tone. As her family grows, more discs can be added, and your mom can watch her tree blossom with every new addition to the family. This stunning time piece is the perfect way to celebrate your mother's timeless love for her children. 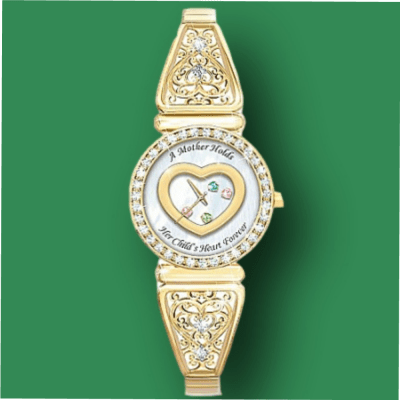 At the center of the watch is a gold-toned open heart that encases up to six colorful birthstone crystals. These birthstones sparkle and float freely against a backing of rich mother-of-pearl, which is inscribed with the endearing message, "A Mother Holds Her Child's Heart Forever." The watch is encircled with brilliant crystals that sparkle like diamonds. The stretchable watch band features an open heart and filigree motif that is embellished by more crystals. What a lovely tribute to your mother's eternal devotion to her children in her heart! This charming serving bowl is perfect for the mom who loves to cook. Personalize this bowl to highlight her specialty. Add a delightful graphic that gives this bowl a personality that represents your mother's culinary spirit. 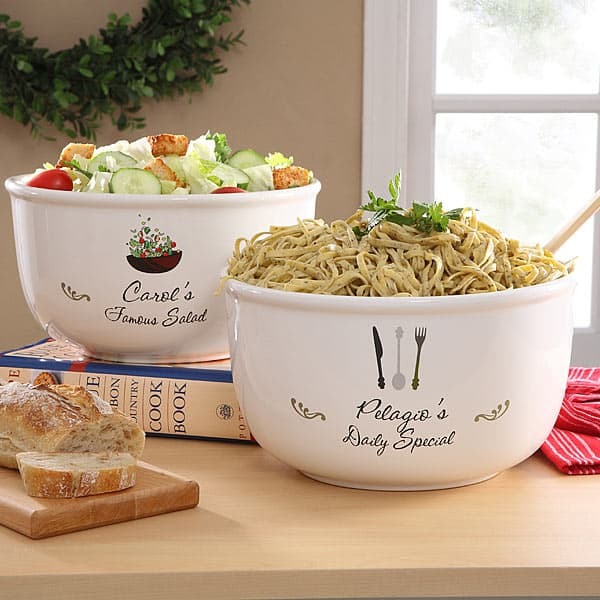 The bowl is large enough to hold enough pasta, popcorn, or any favorite food for the entire family. It will add a whimsical touch to any kitchen decor. This serving bowl will hold a special meaning for everyone in the family for generations to come. Your mother will be moved by your support of the fight against breast cancer. 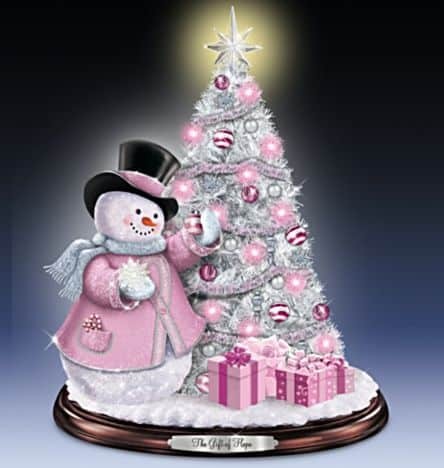 This limited edition Christmas tree features a charming snowman all decked out in his shimmery pink coat embellished with the signature pink ribbon across the front. The tree is adorned with pink and white sparkly ornaments, a silver and pink garland, and 18 pink LED mini-lights that make this a truly festive and meaningful display. It even plays a medley of eight holiday favorites. A percentage of the purchase will be donated to fighting against breast cancer. This lovely Christmas tree is a beautiful symbol representing your family's hope and support in an important cause.